Even though this neon sign no longer works, a shoe repair shop is still there. The sign and shop are located in the Piedmont Avenue shopping district. With the institutional design and the arrow slit windows, what else could this be? The local jail, of course. The bridge leads to the Superior Court. And that pink building in the corner? That's the well-known Mexicali Rose restaurant. All on 7th Street. For more bridge photos, visit «Louis'» Sunday Bridges meme. The Caldecott Tunnel cuts through the East Oakland hills to connect Oakland to the adjoining county. 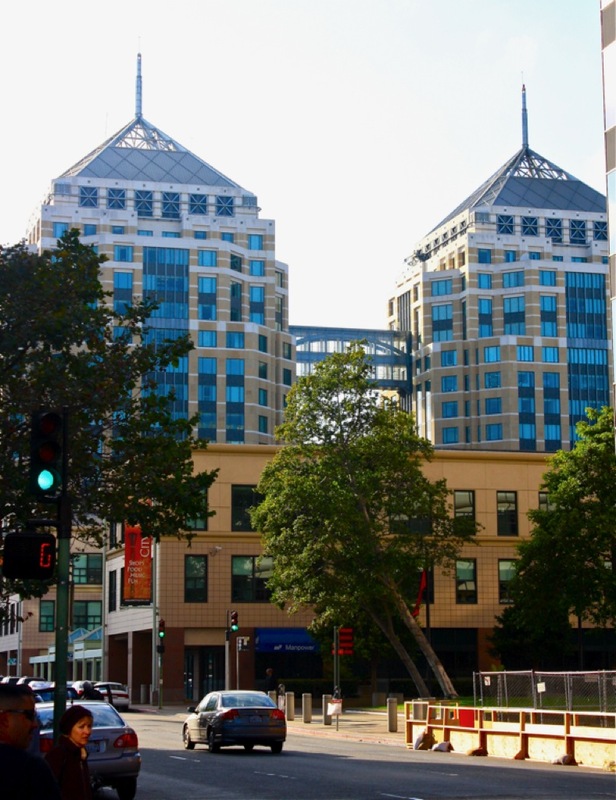 Since the 3rd bore was drilled in the 1960s, Contra Costa County has had a huge surge in population and is now a bedroom community to the East Bay and San Francisco. You can see that commute time involves long waits to crawl through the tunnel. Hopefully the 4th bore, due to be completed in 2013, will help alleviate this traffic snarl. We'll see. Tip: During the most intense commute period, you can drive a winding road over the hills faster than you can drive through the tunnel. Shhh, don't tell. P.S. Note the deer sign. Even though we live in a highly urban area, wildlife is abundant. Besides deer, it is common to see coyote, possum, skunks, and foxes. On occasion, people spot mountain lions. Really. The Fox Theater is a pastiche of styles that mostly look Moorish to my eye. It was built in 1928, fell into decline in the 60s, and was restored and resurrected in 2009. It also houses Jerry Brown's charter school, the School for Performing Arts. 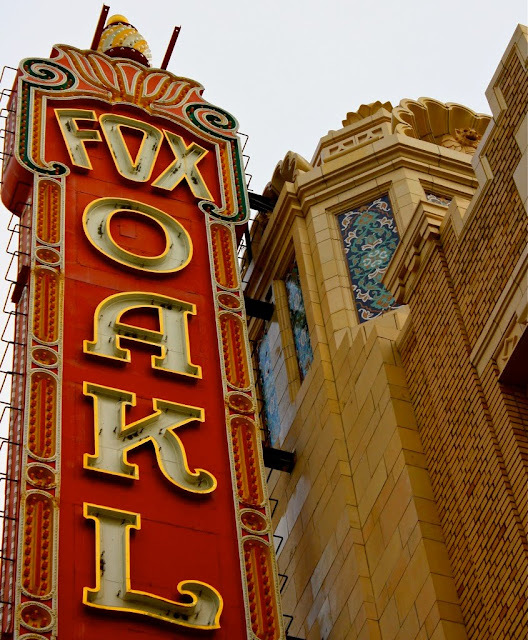 Many popular acts now perform here and the Fox is part of the revival of the Uptown area. For other "F" photos, visit ABC Wednedsay. This shoreline near the airport demonstrates the curative powers of a restored marshland. It is a beautiful place to walk or have a picnic. This walkway allows you a close-up look at the marsh ecology. Quiet despite the nearby freeway, the nesting terns and ground squirrels couldn't be happier. For views of other bridges, visit «Louis'» meme Sunday Bridge Series. Another view of the MLK shoreline park. Taken in the afternoon before the fog came in. For more Skywatch photos, visit Skywatch Friday. A statue of Jack London in the public space named after him at the foot of Broadway. Recently I decided to follow a street above the 580 freeway to its terminus at Skyline Blvd. At the end of the road I found this private property where the rancher was putting his horses through their paces. He gave me a "howdy, m'am" nod, and continued to work his horse. I love the fact that he was wearing chaps and a big hat. Who knew there still are cowboys and ranches in the Oakland hills? Then, yesterday's newspaper had an article about a problem with cattle rustling in the East Bay hills! It looks like the wild west still exists in decidedly urban/suburban Alameda and Contra Costa counties. I also learned that these two counties have 400,000 acres of ranch land still in operation. The second photo shows you how rugged the Oakland hills can be. Much of this area is preserved by parks and watershed land. And grazing rights, of course. For additional "E" photos from around the world, visit ABC Wednesday. Took a stroll along the MLK Shoreline Park late Sunday afternoon. Despite its proximity to the airport and the 880 freeway, the park was a peaceful retreat. I shared the park with families enjoying the day, bicyclers, cawing terns, and a huge colony of ground squirrels. This small area of marshland was restored in 1998 and has been quietly restoring the health of the estuary ever since. This is a bit of a trompe l'oeil. 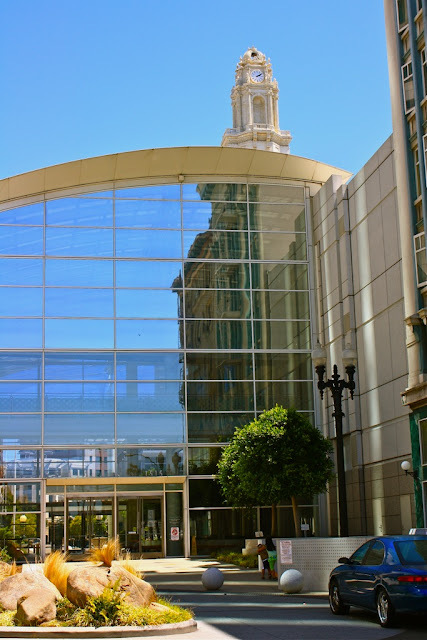 The back windows of the downtown California State Building reflect the multi-story wing on the right. The baroque looking cupola tops our City Hall one block south of the State building. It just happened to align with the structure in the reflection. Serendipity. For more reflective photos, visit James' meme Weekend Reflections. Late afternoon from the High Street bridge looking southeast. 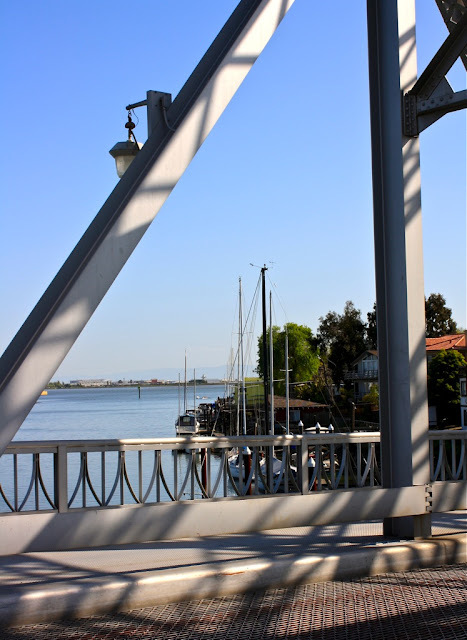 The Oakland side of the estuary is on the left and Alameda boat slips are on the right. This is our typical sky once the fog burns off and before the fog rolls back in. I know, quit whining. Right? For more sky shots, visit Skywatch Friday. I was downtown late in the afternoon taking pictures when I heard rhythm and blues coming from somewhere. I followed the sound to City Hall where the East Bay Blues Society Caravan of All Stars was playing. I assume they were there to advertise the 10th Art & Soul Festival happening this weekend. Teddy Watson was called up from the audience to sing. He slowly walked to the stage aided by his cane. 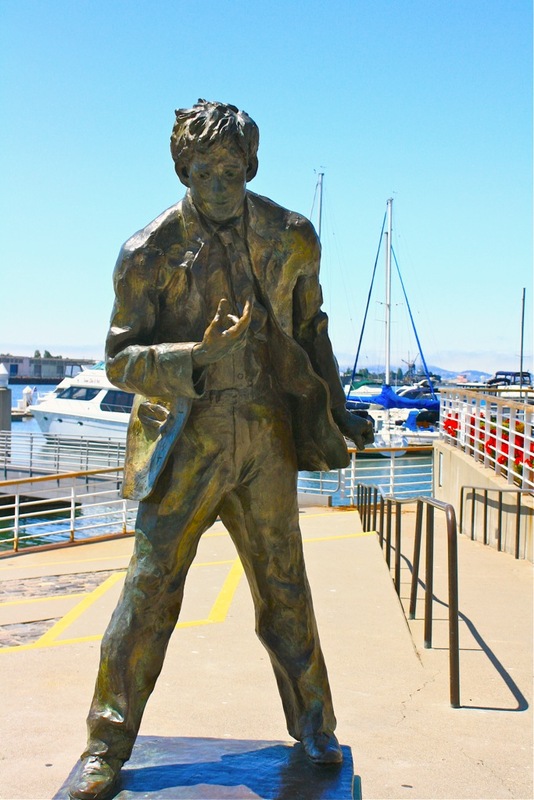 Once he got there, he put down the cane, performed some bluesy dance moves and then sang his heart out. Still the showman. The audience loved it. Bravo. The small crowd sits in the mini-amphitheater in front of City Hall. The official Oakland oak tree is in the background. I stayed until the fog and chilly air sent me home. A couple is taking advantage of the sunny afternoon at Jack London Square. Later that afternoon was a wine and food festival. By then the fog had come in and it was breezy and cold. For other "D" photos from around the world, visit ABC Wednesday. This mural is at 19th and Broadway behind the Fox Theater. It is on one of those new condo buildings built in the Uptown area during the Jerry Brown mayoral administration. The mural was done in 2009 by Pineda and Newman. A pedestrian bridge joins the two towers of the Ronald V. Dellums Federal Building. Dellums is our former congressman and current mayor. It has over a million square feet of office space, houses over 2000 workers, and was built to be as energy efficient as possible for the times. It was a welcome addition to the skyline when built in 1993 and is easily spotted from afar. It anchors a complex of government and private business office space collectively called City Center. For a wide array of other bridges, visit «Louis'» meme Sunday Bridges. Better yet, post a bridge of your own. This old quarry borders the parking lot of a busy shopping center. Until recently the view was obstructed by tall bushes fronting the surrounding chain link fence. Recent construction now allows an unobstructed street level view (albeit still through the fence and barbed wire). I read that "traprock" was quarried here a long while ago and don't know when operation ceased. A creek runs through the Claremont Country Club and tumbles by waterfall into the lake. A member told me that the club (posted Tuesday) owns the quarry and pumps the lake to water the golf course. I was pleased that the sun came out long enough to allow a late afternoon reflection to share through James' meme Weekend Reflections. Have a relaxing weekend. Another cool neon sign. I like the sputnik globe on top. Too bad the cocktail glass doesn't light up. 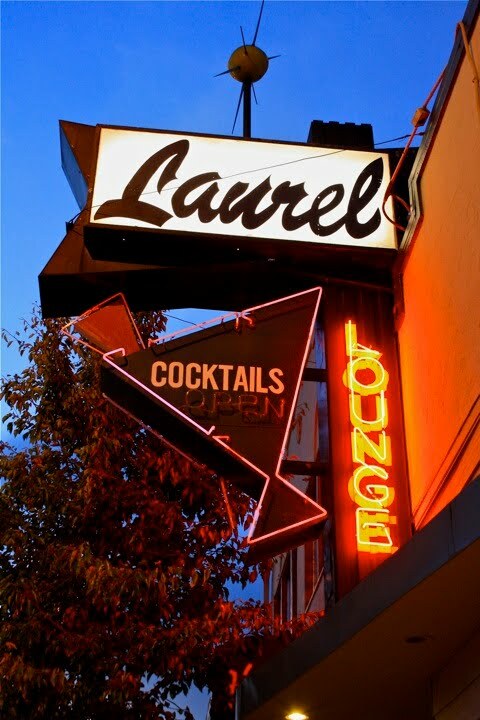 Like the sign says, this is in the Laurel District in East Oakland. Funk grooves and laughter were coming out of the bar. Golf in Oakland? Ya betcha! This 18-hole golf course was established in 1903 and the country club some time after. Between 1937 and 1943 Oakland hosted The Oakland Open. The first one was played on this course. The winner was a chap named Sam Snead in his first professional win! It is strictly a private club now and costs megabucks to join plus a hefty monthly fee for services. The surrounding neighborhood in Upper Rockridge is quite expensive with large, beautiful homes. The immediate area around the course was spared damage in the 1991 firestorm but the area above the course lost many, many homes and some lives to the fire. Besides the large, open expanse of green this course provides the area, I was impressed by how humid the air felt on the course. Since it doesn't rain here in the summer, they must really pour the water to it to keep it so green. For other "C" photos from around the world, visit ABC Wednesday. Welcome to the Pardee Home and museum. Enoch Pardee came to California for the Gold Rush and ultimately served in the state legislature. His son George served as governor and was particularly well respected due to his leadership after the 1906 earthquake. The family home, built in the late 1860s, is considered to be one of the finest preserved Italianate homes in the state. 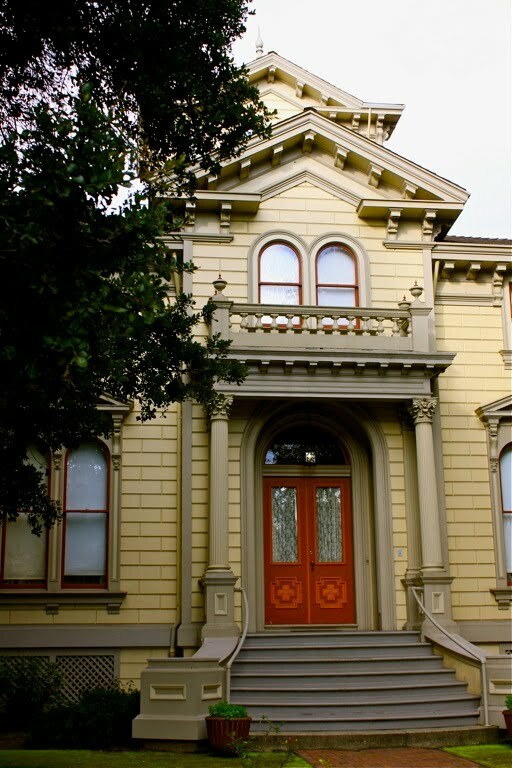 Lucky for us, Oakland is rich is Italianate architecture. George's wife was a collector extraordinaire of many things including Chinese altars, Alaskan scrimshaw, and Mexican rosaries, which are displayed in the home along with many of the original furnishings. In the 1970s the home was slated for destruction for the building of the 980 freeway. Oaklanders rose up in protest and ultimately had it declared an historical landmark, thereby preserving it and its furnishings. 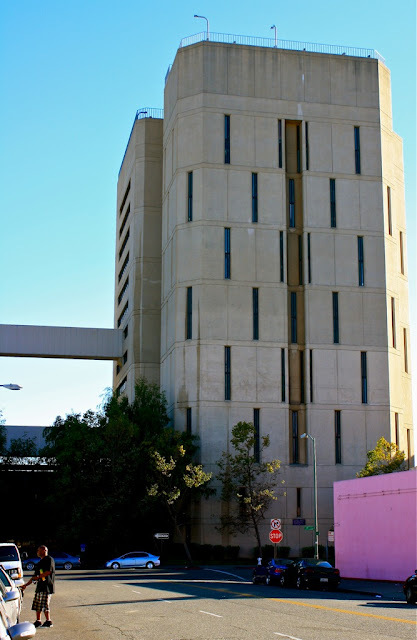 Though saved from the wrecking ball, it is now cloistered in a less than beautiful part of downtown where two freeways converge. You can actually see it from the freeway where it glows despite its surroundings. This is the Flux 53 Theater in East Oakland. It is a performance space that offers a variety of musical and theater events. This tromp l'oeil mural snazzes up a faded block of businesses and older homes in a gritty area of town. I really like the "reality behind the reality" theme working here. It has both an exotic and hopeful message. I wish the founders luck in achieving their vision. Click here to view thumbnails for all participants in this month's City Daily Photo Theme Day.